With summer vacation on its way, people all over the country (and the world) are gearing up for their trip to Maui! If you’re in the final stages of your vacation-planning, it’s time to book your Luxury Maui tours. Like, right now. Here’s why! Traveling with the whole family? With multi-generational travel on the rise, groups that include grandmas, aunts, uncles, and more are all joining forces for truly epic family vacations. Move over, honeymooners! If your group is made up of more than four people, you’ll want to book your seats early to make sure your tour fits in with your carefully-calibrated Maui itinerary! More people are traveling to Hawaii and including more than one island during their vacation. If you’re only spending a two or three days on Maui before you’re off to your next island adventure, planning is key. If you want to be sure that you can get the tour you want on the date you need, book now. Nope, not a typo– “bleisure” travel is the term for mixing leisure elements into your business trip! While Maui wasn’t traditionally a business-travel destination, it’s now a popular destination for seminars, conferences, and corporate events. If you need to fit your dream tour into your schedule of meetings, presentations, and networking, call us today and reserve your spot! Above all, remember that summer is the busiest time for vacationers to Hawaii– so once you’ve decided on a date for your adventure, book directly with us and save! When choosing an adventure with Temptation Tours, you always have plenty of options available to make your luxury island adventure exactly what you’re looking for. When you’re planning a tour, you might wonder how you’d like to experience your Road to Hana or Haleakala journey—in a small, intimate group of like-minded travelers, as an exclusive pre-arranged tour for just your group, or as a fully customized private-charter adventure. All of our pre-arranged tours are conducted in a small-group setting, with a maximum of eight guests per tour, all in the comfort of a Luxury Limo-Van. 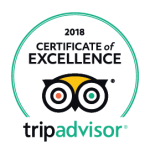 When you book one of our tours, you can expect a full tour of six to eight guests—each of them discerning, luxury-minded travelers like yourself. With your expert Hawaii-Certified Tour Guide at the helm, you’ll spend a day learning, sharing, and exploring, and don’t be surprised if you leave your tour having made several new friends! Guests from all over the world swap email addresses, social media accounts, and make life-long friendships on our adventures every day. Aside from the opportunity to meet and mingle with other guests, you’ll also enjoy simple, per-person pricing, and the customary Tour Guide gratuity is given at your discretion. If you have your heart set on one of our pre-arranged tours, but would prefer to have the tour limited to just your group, we can absolutely do that! 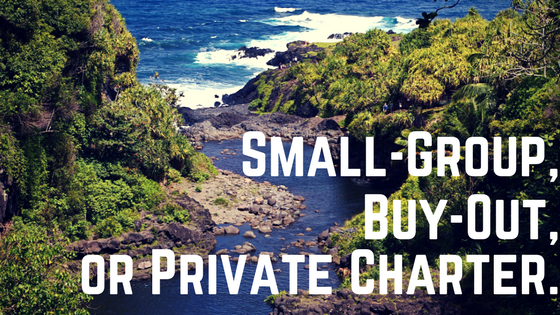 You’ll simply purchase all eight seats in the tour (or six, for our Haleakala Sun-Trek or Hana Sky-Trek), plus the included Tour Guide gratuity, and then sit back and relax for your worry-free, exclusive tour! Want to visit a spot that’s not on one of our pre-arranged tours? Call us to arrange for a private charter! We can visit virtually any spot on the island, provided it’s safe and not private property, and have a knowledgeable reservations staff who can assist you in planning your perfect itinerary for the day. Our private charters are charged on an hourly, per Limo-Van basis, with a four-hour minimum, and will include Tour Guide Gratuity as part of the price. Whether you’d like a customized farm tour, a tour of West Maui with a no-host lunch stop at your favorite restaurant, or even a tour of Maui’s best Shave Ice spots—we can do it! Whatever your touring preferences, we have the perfect adventure for you. Give us a call at 1-800-817-1234, or send us an email, and let us help you find your perfect luxury Maui adventure. Have you had a chance to check out our new video? Get a “birds-eye” view of the Road to Hana, as well as an insider’s look at our spacious, comfortable, Luxury Limo-Vans! 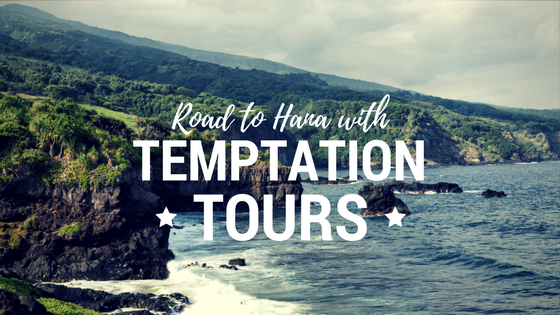 You’ll travel in style with Temptation Tours, and your Hawaii-Certified Tour Guide will expertly navigate all 617 hairpin turns along the Road to Hana. All you need to do is sit back, relax, and experience the sights, sounds, and stories that surround this incredible, historic Maui region. Join us soon, and experience the very best on your Road to Hana adventure! 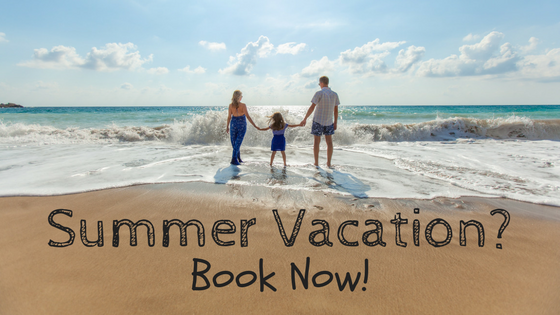 Call us at 1-800-817-1234 to book today! Did you know that if you join us for two different tours during your trip to Maui, you’ll get a cash-back rebate during your second adventure? 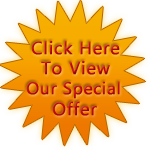 Mention this offer to us when booking, and we’ll take care of the rest! Not sure which two tours to book? 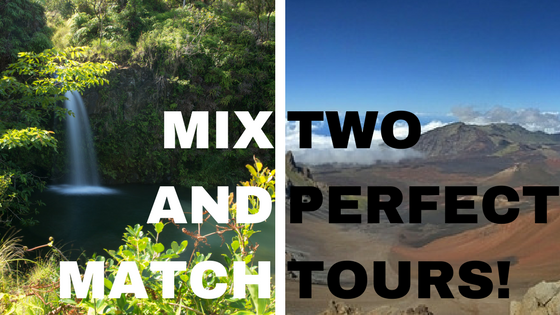 Here are some of our favorite tour combinations to help you maximize your Luxury Maui experiences! Enjoy our two most popular adventures, plus have time for all your other Maui activities! The Haleakala Sunrise, an early-morning trek to the Summit of Haleakala, is a “bucket list” item for thousands of Maui travelers every year. Enjoy those enviable views of the sun rising from 10,000 feet above sea level, plus sit down to a tasty breakfast after leaving the National Park. Later in your stay, join us again at the Kahului Heliport to begin your Hana Sky-Trek, a combination Limo-Van and helicopter tour that lets you enjoy the full Road to Hana, a relaxing picnic lunch, a refreshing waterfall swim, and a thirty-six-minute “flightseeing” tour, all in a half-day adventure! Want some truly unique experiences? Join us for our Hana Ultimate tour, our relaxing, luxurious Road to Hana tour for the distinguished foodie. This full-day Road to Hana adventure includes a run-of-the-menu breakfast at Paia’s famous Café Mambo, as well a four-course luncheon at the Preserve Kitchen + Bar, the beautiful dining experience at the Travaasa Hotel in Hana. Then, join us for an early departure from your hotel for our Haleakala Sun-Trek, including a thirty-minute morning flight over Haleakala, a return to Café Mambo for a no-host breakfast (wanna try something different this time? ), and a unique tour of upcountry Maui. You’ll visit Makawao Town, Surfing Goat Dairy, and Ocean Vodka. Picnic lunch included, all in the comfort of a Luxury Limo-Van! If you’re looking for laid-back, relaxing excursions, while still experiencing as much of Maui as possible, these might be the two tours for you! First, our Summit Lavender Sojourn is a great way to experience Upcountry Maui, with a visit to the Summit of Haleakala, Ali’i Kula Lavender, MauiWine, and Makawao Town. On our Hana Picnic tour, enjoy a classic Road to Hana adventure, with visits to Keanae Peninsula, Pua’a Ka’a State Park (for a waterfall swim! ), Hana Tropicals flower farm, Hana Bay, and the famous black-sand beach of Waianapanapa. Of course, this offer stands for any two tours, so feel free to mix and match to your heart’s content! Need suggestions or ideas? Call us, and let us help you pick out your perfect tour—or help you to create your own Private Charter! We can’t wait to host you on board one of our Luxury Limo-Vans for a Maui adventure (or two!) that you won’t forget!